Aluminum signs last for over 10 years outdoors. Find over 500 different designs. 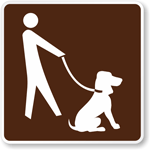 Buy signs just like our national and state park customers. Find official stock signs as well as easy-to-customize templates. Potent reflectivity is visible both day and night. Reflective signs now required by the DOT for parking lots and roads.